There are five tombs belong to Ottoman Sultans and their family members in the historical buildings adjacent to the Hagia Sophia Museum. All restorations done and the buildings could be finally ready to be seen. Normally restorations of historical buildings never end, but particular work should be finished in time. According to Fatih Sultan Mehmet’s testament, Hagia Sophia had to be taken good care of and in recent years his will was fulfilled. Primitive toilets in Hagia Sophia and the scaffolding which has been standing inside for 17 years were removed; the face of the Angel Seraphim mosaic was uncovered; baptistery and the oldest baptism pool were opened to visit, restorations of Sultans’ tombs located in Hagia Sophia’s courtyard were completed. All these works made everybody even the Sultan’s soul satisfied. The findings which were found during the restorations clarified the sepulchral culture of the Ottomans. All wraps and clothes which were found in tombs are in exhibition and tombs have been covered with the same colour overlays. Although tombs are named after Sultans, tombs were also shelters for the members of their families and their dynasty. 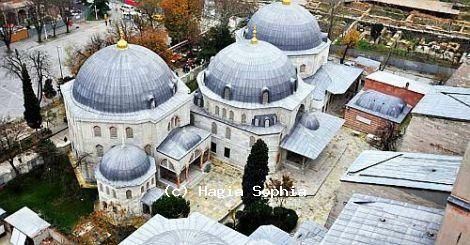 It is also known that after Sultan Selim II even the wives were also buried in the same tomb with Sultans.